France says it was the subject of 24,000 cyber-attacks against defence targets last year. Defence Minister Jean-Yves Le Drian said such attacks were doubling every year and this year's presidential elections could be targeted. He said it would be "naive" to think France was immune to the type of cyber-campaign that targeted the US election, which has been blamed on Russia. Mr Le Drian is overseeing an overhaul of France's cyber-security operations. 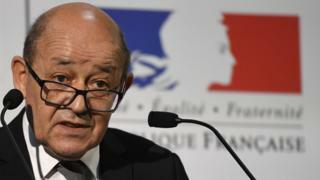 Cyber-attacks in France have increased substantially in the last three years and have become a serious threat to the country's infrastructure, Mr Le Drian said. In an interview with Le Journal du Dimanche newspaper, Mr Le Drian said that France "should not be naive". He said that thousands of external attacks had been blocked, including attempts at disrupting France's drone systems. His warning comes in the wake of a US intelligence report alleging that Russia was involved in an attempt to influence the 2016 presidential campaign. Russia denies any involvement in cyber-attacks or hacking. French elections in April and May this year are being carefully watched after the surprise victory of US President-elect Donald Trump, who said on Saturday that those who oppose good relations with Russia are "stupid people, or fools". French conservative candidate Francois Fillon has said that he wants to improve relations with Russia and has been praised by Russian president Vladimir Putin. Far-right candidate Marine Le Pen also favours closer relations with Russia. Relations between the two countries deteriorated after France's socialist president, Francois Hollande, played a key role in imposing sanctions on Russia when Crimea was annexed by Russia in 2014. Mr Hollande also suggested last year that Russia could face war crimes charges over its bombardment of the Syrian city of Aleppo. In April 2015, a powerful cyber-attack came close to destroying French TV network TV5Monde, which was taken off air. A group calling itself the Cyber Caliphate, linked to so-called Islamic State (IS), initially claimed responsibility. But an investigation later discovered that it was carried out by a group of Russian hackers.